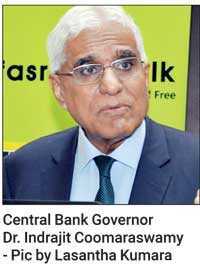 Central Bank Governor Dr. Indrajit Coomaraswamy yesterday voiced concerns over politicians resorting to populist policies with Sri Lanka anticipating possible elections, warning it would undermine fiscal consolidation essential to ensure debt repayment. Addressing at the launch of the Financial Literacy and Entrepreneurship guides developed by CFA Society and the Central Bank for public awareness, Dr. Coomaraswamy said progress towards achieving sustainable external debt dynamics has slowed down, but assured the situation is still manageable provided the Government continues on the trajectory of fiscal consolidation. “We are not going to crash; we can manage this, but we have to maintain financial discipline. If, like in the past, we have a whole lot of populist policies for an election, then things could get very serious,” the Governor warned. According to him, populist policies and entitlement culture had been mutually reinforcing each other. This situation has been worsened by low levels of economic understanding among the general public who have not realised that Sri Lanka has been living beyond its means since independence for seven decades. CFA Society Sri Lanka Advocacy Chair Ravi Abeysuriya also said that politicians thrive on people’s lack of economic literacy. “Lack of economic literacy is a key reason why people are not asking deep questions about certain Government decisions. No one questions about how debt came about over the years, but every single citizen pays for this. Sri Lankan voters do not realise the damage that has been done not just for today, but for future generations as well,” he added. Abeysuriya claimed that the education system, particularly schools, have been very poor in imparting financial literacy for people to be more informed to push politicians and institutions for better financial and economic management. When asked if there would be any hiccoughs in terms of debt repayment, Dr. Coomaraswamy pointed out that they do not anticipate such a situation as the Central Bank and the Treasury have worked out a medium term debt management strategy. “We don’t anticipate any (situation), but one has to be honest and candid about the situation. Clearly, the political developments have increased the risk premium attached to lending to Sri Lanka. We have to undertake significant borrowings going forward, where the terms will be tighter, the cost will be higher, and the tenure will be shorter. We still have those plans to raise money to pay those obligations. However, the room to manoeuvre has become less,” he added. The Governor also said that they will raise up to Rs. 310 billion, equivalent to $ 1.7 billion, for liability management under the new Active Liability Management Act. He noted that the individual banks will be able to raise money under the new Act, which has been approved by the Cabinet and passed through the Parliament. Revising the original economic growth target of 4%, the Governor said it would shade under 4% this year. In terms of the recent ratings, the Governor said international rating agencies have become more brutal than the International Monetary Fund (IMF) or any other institution for that matter. “I personally feel that the rating agencies were hasty. They should have waited till the Court processes were completed and there was clarity on the situation. I think it was unwarranted. The IMF actually recommended to Moody’s that they should wait, but Moody’s went ahead and downgraded. Now we are in a different paradigm. We have to be much more disciplined,” he stated. The Governor categorically said the fiscal consolidation program had not deteriorated in a material way and that is evident by the fact that on 26 October, the Central Bank was able to reach a staff-level agreement with International Monetary Fund (IMF) at the fifth review of the Extended Fund Facility. “They (IMF) felt confident enough to be ready to announce the agreement on 26 October, which is a reflection that they were satisfied with their assessment on the performance and outlook of the economy. We were to get the next tranche on 30 October, but following the political developments, they have put that on hold,” he explained.